Shopping for Pulp Action Figures? Amazing action figure recreation of the pulp hero, Rocketman! Detailed action figure includes real leather jacket and belt. Real metal comprises the helmet with working visor, jet pack, luger, cannon, control panel, and belt buckle. Measures 12-inches tall with a 1:6 scale Phicen seamless poseable body! Go Hero, Executive Replicas, and Phicen Ltd are proud to present George Wallace as the Rocketman! One of the most fondly remembered and instantly recognizable characters in 1950's science fiction adventure is Rocketman. 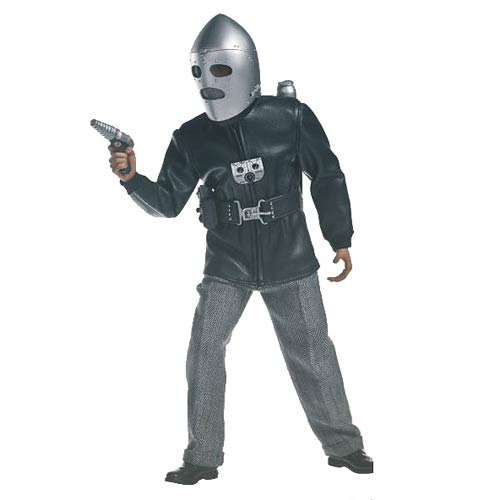 With the trademark bullet-shaped helmet, black leather jacket, and rocket-pack, this 1950's era icon safeguarded Earth from off-world alien invaders, evil robots, terrestrial henchmen, mad scientists, and malevolent Martians. The Rocketman in his amazing atomic-powered flying suit made many appearances including 1949's classic cliffhanger, King of the Rocketmen, in the 1952 serials, Radar Men From The Moon, and Zombies of the Stratosphere, and a short-lived theatrical series entitled, Commando Cody, Sky Marshal of the Universe. This 1:6 scale figure of the Rocketman, with the likeness of actor George Wallace, captures the retro-futuristic flying action that continues to influence countless entertainment properties from Star Trek to Star Wars to Dave Stevens' The Rocketeer. Get ready to blast off with the Rocketman figure, which features an accurate head sculpt of actor George Wallace, a metal helmet with working visor and flight cap, a metal jet pack, metal Luger pistol with Raygun attachments and clip, a metal cannon, a metal control panel with adjustable knobs, a radio, leather jacket, detailed outfit (includes pants, shirt, tie, and socks), a leather belt with metal belt buckle, a 3-inch rocketship mini model, 3 sets of hands, a Phicen 1:6 scale poseable body, and a figure stand! Ages 17 & up.